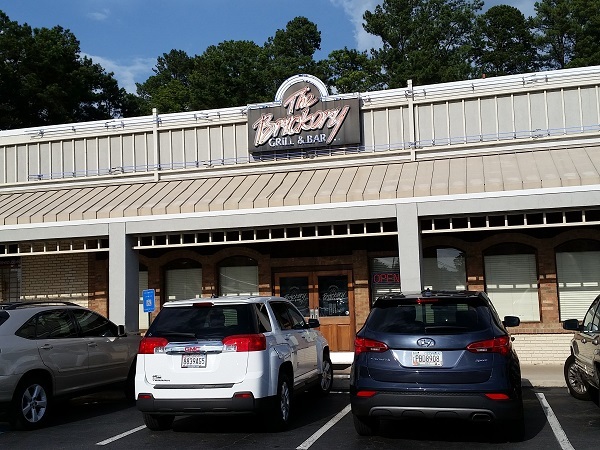 The Brickery Grill and Bar, Sandy Springs GA (take two) (CLOSED) – Marie, Let's Eat! Last spring, Marie went to a media event at The Brickery in Sandy Springs – here is her story about it – and while it’s a bit outside our neighborhood radius and while we really don’t make anyplace a regular haunt, we’ve made a couple of trips over there since, for their terrific onion rings and fried chicken. Bruce and Sally Alterman, who met in college at The University of Oklahoma in the late 1960s, opened their first restaurant in Atlanta in 1988. It was called Perimeter Cafe and was just a couple of exits over from where they would launch The Brickery in 1992. A week ago, we spoke with David, one of the managers at this venerable restaurant, and he told me that the Altermans chose to close Perimeter Cafe after a very handsome bid was placed on the space by Ruby Tuesday. And today, across the street from The Brickery, the region’s best-known comedy club, The Punch Line, recently vacated what had been its home for three decades, now hopping around town as a pop-up event. Nothing stays the same in Atlanta. Retail and restaurants are always moving around, which is why a space like The Brickery is so incredibly special to its devoted clientele. It’s the very best sort of neighborhood restaurant, where darn near everybody is a regular. If it’s your first visit, the staff fully expects to see you again, and frequently. The Altermans offer a menu of classic Americana comfort food, a menu full of chicken, steak, crab cakes, and vegetable offerings, and nightly specials. But over the last couple of months, the city has really started to note what the regulars know very well. The Caesar Burger, the house specialty, really is something special and amazing. Last year, our friend Iron Stef (linked below) called it the best burger she has had in Atlanta. 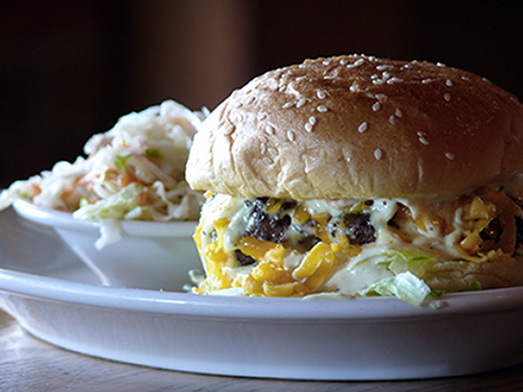 In April, Thrillist ranked it one of the eleven best burgers outside the perimeter. Last month, the local Fox affiliate featured it on their weekly Burgers With Buck segment. People are talking about this special treat, and Bruce invited us to come in to try one. The photo above was provided by the restaurant; as you see in the second picture, it’s too dark inside for my camera to be worth a darn. Onion rings are the classic companion to the burger, and no, between all this parmesan dressing and these sweet rings with their wonderful batter, you’ll want a light salad for lunch the next day. These are among the very best onion rings in Atlanta. The batter is simple, but they’re made to order with fresh onions delivered several times each week, and I absolutely loved them to bits. David asked whether we wanted dessert. Heavens, no, not after an indulgence like this! But I’ll tell you: the next time that we come in, I’ll strongly consider ordering a salad and leaving plenty of room for a slice of a freshly-baked pie. 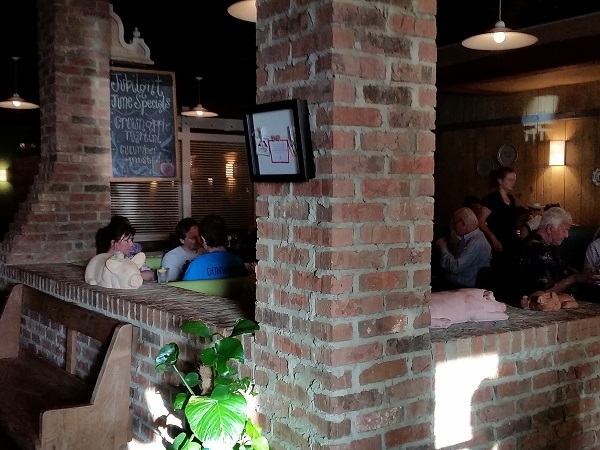 The Brickery is in a pretty old shopping center by area standards, dating back to the 1970s, and indeed The Brickery’s large space – it seats about 130 – was once the home of a seafood restaurant. I keep saying that the Altermans have a devoted base of customers – as with many places with nearly 25 years of history, mind you, it’s not an especially young base – and even on Monday evenings, they keep this place pretty busy. If you don’t live in the neighborhood, it’s really worth the drive to sample this excellent burger. Careful, though, you might just become a regular. You’ll certainly be greeted like you’re one already. Posted on June 26, 2015 August 22, 2017 by Grant G.Posted in atlanta, burgers, casual american, georgiaTagged atlanta, burgers, casual american, georgia, sandy springs. Pingback: Kaleidoscope Bistro & Pub, Brookhaven GA (take two) – Marie, Let's Eat! The Brickery was one of my favorite places among the few that I have visited in Atlanta. I was sorry to read that they closed. Their fried chicken was just amazing.